Parramatta hit the headlines recently when one of its cafes won the prestigious 2013 SMH Good Cafe Guide award for the best cafe in Sydney. This surprised many Sydneysiders but definitely not the locals. Parramatta locals know that they live in the most cosmopolitan suburb in Sydney and that the suburb is home to many brilliant cafes and restaurants. The majority of these are located along Church St, aka Eat Street and now another cool cafe has swung open its doors on Eat Street, but this time it's actually up the North Parramatta end, away from the hustle and bustle of the main drag. 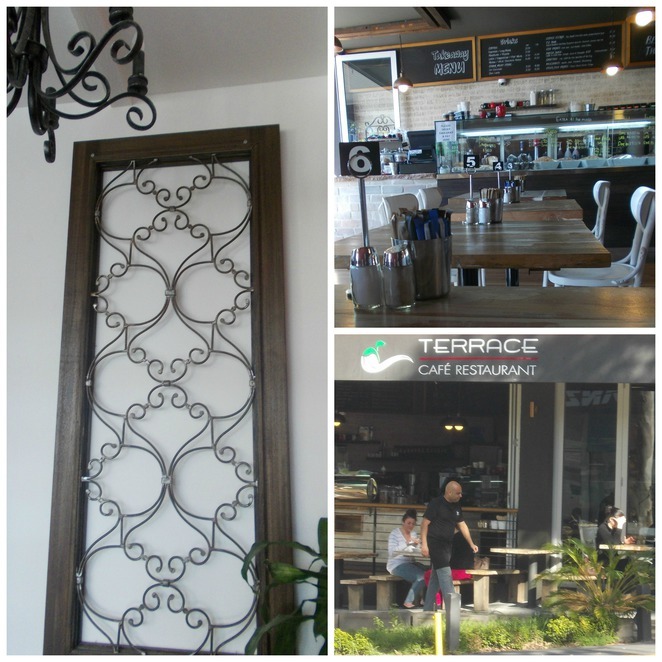 The Terrace Cafe/Restaurant is a large cafe with an industrial chic interior. The interior is spacious yet welcoming, cool yet comfortable. Recycled timber has been used throughout and metal wall art adds to the charm of the space. Lime washed tables and white chairs complete the picture. The industrial chic design even extends to the loos where recycled corrugated iron has been used in the cubicle doors. There is bench seating outside the cafe for those that want to watch the world go by, but the world is a bit boring up this end of town, so perhaps sit inside. The staff are attentive and very fast. You can tell that they are hospitality professionals. The cafe does both a busy take away and sit down service and on the morning we visited with only a barista and one floor staff on, I was amazed at how quickly everyone was served and it all happened with a smile, no too cool for school in this joint. The Terrace Cafe/Restaurant's food is awesome. Not only is the menu reasonably priced, but the portions are huge and all very tasty. You will not leave feeling hungry. Our breakfast selections were the Parmesan Eggs and also the Terrace Brekkie. The Parmesan Eggs were topped with the most delicious mushroom and thyme ragout and they were served with a wholesome soy and linseed bread. The Terrace Brekkie was served with perfectly poached free range eggs, roasted tomatoes and a very generous serve of bacon. If you are a fan of Dr Seuss maybe you should stop by and order some green eggs - poached eggs served on sourdough drizzled with pesto oil and served with baby spinach and avocado. If you decide to dine at lunch time, the menu is both extensive and mouth watering. How does a Tandoori Chicken Sambo with spinach, roasted capsicum, tomato and minted yoghurt served with beer battered fries and side salad for $15.00 sound? There are a stack of other "sambo" combinations as well for you to choose from. Or would prefer the healthier Portugese Spiced Chicken Salad with roast butternut pumpkin, cherry tomatoes, spanish onion, cucumber and fetta drizzled with a seeded mustard dressing for $17.50? 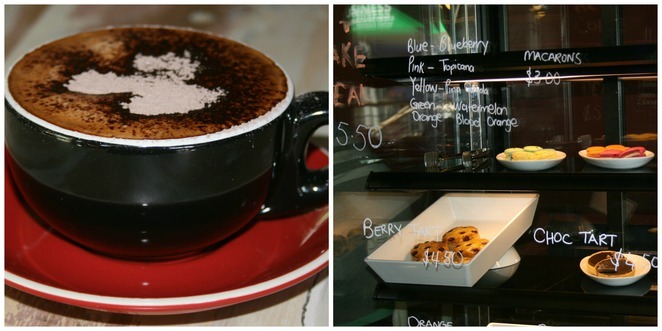 If you are just after coffee and cake the Terrace has a current special deal of $5.50! Choose your favourite cup of joe and team it up with a freshly baked orange friand or a pina colada macaron. The Terrace serves up a mighty fine Allpress brew. So Sydneysiders head on out to Parramatta and see how the west is the best in town for some mighty fine food and and even finer coffee. You weren't kidding when you said they were generous with the bacon. That Terrace Brekkie looks very filling. That is a great price for a Terrace Brekkie! You would only get half that here in Perth for the same price!